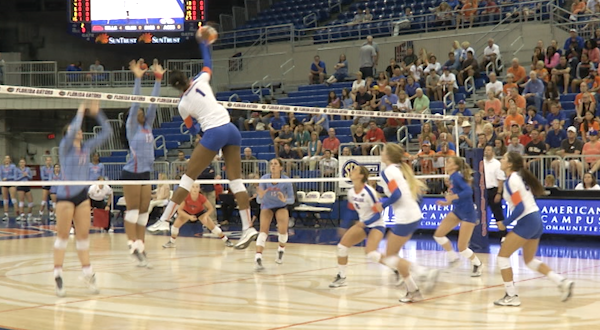 In their first five-set match of the season, the fifth ranked Florida volleyball team fell to the 25th ranked Missouri Tigers on Sunday on the road. Both teams now have identical 14-2 SEC records. The Gators started out with the first point of the match thanks to a kill by Alex Holston. Not to be outdone, Missouri quickly took back the lead, 6-4. The Tigers held a four-point lead over Florida at the official’s timeout, 15-11. Florida would add on seven more points, before Missouri took the first set, 25-18. Missouri started out with the first point in the second. Both teams would go back and forth a few points, before Rhamat Alhassan served up an ace. A kill by Alex Holston would even the score 6-6. From there on, it would be a back and forth between the two teams. Florida took their first timeout at the set, Missouri leading 14-11. The Gators managed to even the score back 19-19 when the Tigers took their first timeout in the second set. Florida allowed Missouri four more points in the second set, before the Gators took the second set 25-23. Florida took the first two points of the third set before Missouri got a point in. The two teams kept the score close before the Tigers broke away, 14-10. Florida managed one more point when Missouri went on 4-0 run, 19-11. The Tigers held the Gators to only four more points before taking the set, 25-15. Just like in the second set, Missouri took the first point of the fourth. After being tied 2-2, the Gators took the lead and never looked back. Florida held a four point lead when the Tigers took their first timeout, 8-4. Missouri was still four points behind when Florida took their first timeout of the set, 22-18. Missouri managed to get in three more points, but it was the Gators who left with the fourth set, 25-21. The first point of the final set went to Missouri, but Alex Holston quickly tied it back up 1-1. Both Florida and Missouri went back and forth before the Tigers took a three point lead, 10-7. In the end, it was the Tigers who won the hard-fought set, 15-10. Both teams had big numbers with this match. Missouri led in kills with 71 to Florida’s 62. 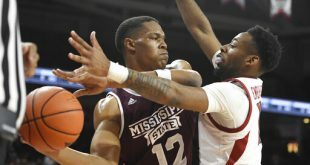 The Tigers also had 11 blocks over Florida’s five. The Gators did outdo the Tigers in aces, 4-3. The combined efforts of Caroline Knop and Carli Snyder also gave Florida a lead over Missouri in digs, 70-65.
.@aleh3's 22 kills (season high), @carli_snyder's 19 kills and 20 digs (career high) not enough today. Alex Holston led the Gators in kills with 22, a season high. Missouri’s Carly Kan led both teams with 25 kills. Her teammate, Melanie Crow, was second on her teams for kills with 20 and third overall between the two teams. Florida head coach Mary Wise says those two players were key in Missouri’s win over the Gators. The Gators have two more matches in the regular season, facing Auburn and Arkansas. Florida heads back home to face Auburn on Wednesday. For Coach Wise, Wednesday night’s match could be the most important one the Gators have played yet. Wednesday night’s match starts at 8.